Drawing and painting outdoors are daily activities for Tom Carment. 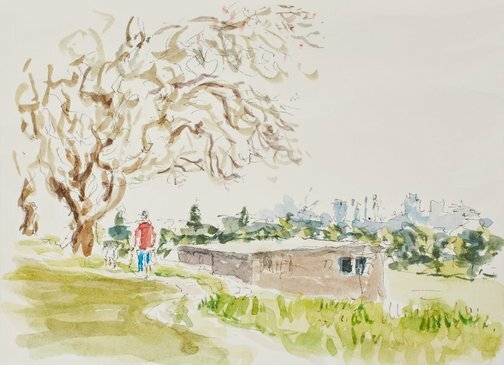 His ‘studio’ is a backpack of drawing and watercolour equipment that travels with him wherever goes, offering him the flexibility to stop and draw at a moment’s notice. He works in small sketchbooks or on sheets of paper that fit easily in the palm of his hand, building up bodies of work on a theme or subject, reflecting the story of his life and the changes he observes over time. Carment’s subjects are seldom the most stereotypically picturesque or beautiful. Many are overlooked or unloved remnants of human presence, or nature unkempt and overgrown. Sometimes his subjects recall for him the work of another artist or a film he has seen, while at other times they have strong personal associations – places he has lived in or travelled to, buildings he once painted as a house painter or beaches where he sat and drew while his children played on the sand.